India's House is a family owned restaurant that has been serving Columbia, Missouri, for over fifteen years. 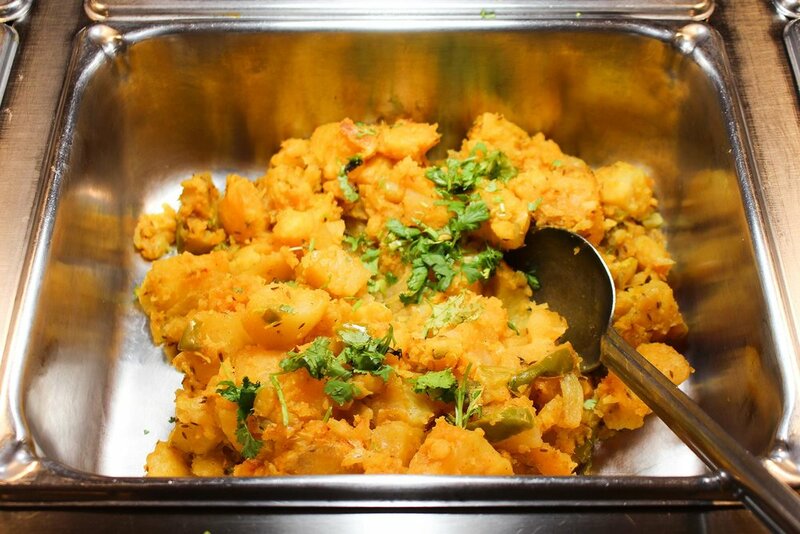 We specialize in traditional Northern Indian cuisine, offering a wide variety of entrees and a lunch buffet. When ordering from the menu, customers can choose their own spice level for each dish. We offer dine-in or carry-out options. Our accommodating menu and buffet offer both meat and vegetarian entrees. We also have plenty of gluten-free and vegan options! Fresh vegetable sliced, dipped in a garbanzo bean batter, deep fried (6 pieces). Triangular pastry stuffed with potatoes and peas. Triangular pastry stuffed with ground meat and spices. Homemade cheese sliced, dipped in a garbanzo bean batter, deep fried. Chicken strips dipped in a garbanzo bean batter, deep fried. Leavened bread stuffed with minced meat. Leavened bread stuffed with mozzarella cheese. The famous lentil soup made with coconut, carrots and homemade spices served with a wedge of lemon. Chicken marinated in yogurt sauce and fresh herbs and selected Indian spices. Boneless chicken marinated in fresh spices. Mince meat spiced with ginger, herbs and onions, roasted on skewers. Boneless lamb pieces marinated in yogurt and fresh spices. Jumbo shrimp delicately marinated in spiced garlic, served with mint sauce. Juicy spiced boneless chicken stir fried with fresh onions, tomatoes and green peppers. Tandoori chicken simmered in a sauce of fresh tomatoes and exotic herbs. Charcoal roasted chicken cubes in moderately spiced sauce. Chicken cooked with mix vegetables. Juicy spiced lamb cubes stir fried with fresh onions, tomatoes and green peppers. Lamb cooked in a blend of tomatoes and spices. Cubes of lamb prepared with potatoes and hot spices. Charcoal roasted lamb cubes in moderately spiced sauce. Juicy lamb cooked with vegetables. Minced beef prepared with peas. Juicy spiced beef cubes stir fried with fresh onions, tomatoes and green peppers. Beef cooked in a blend of tomatoes and spices. Mildly spiced beef cubes in a cream sauce with cashews, almonds and raisins. Cubes of beef prepared with potatoes and hot spices. Juicy beef cooked with vegetables. Shrimp prepared with potatoes and hot spices. Mildly spiced shrimp in a cream sauce with cashews, almonds and raisins. Charcoal roasted shrimp in moderately spiced sauce. Shrimp stir fried with fresh onions, tomatoes and green peppers. Shrimp cooked in a blend of tomatoes, onions and curry spices. Shrimp cooked with mix vegetables. Fish prepared in a sauce of tomatoes and spices. Char broiled Fish Tikka cooked in aromatic and deliciously creamy sauce. Cauliflower and potatoes sautee’d in herbs and spices (Can be prepared vegan). 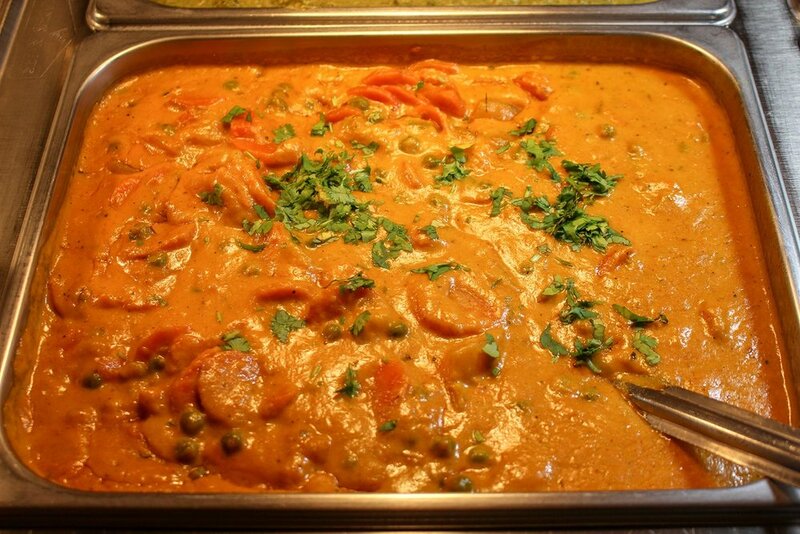 Fresh grated vegetable fritter cooked in a tomato cream and onion sauce (Contains Nuts). Mixed vegetables sautee’d in cream herbs and spices. Roasted eggplant, cooked with tomatoes and onions (Can be prepared vegan). Lentils cooked in spices and cream (Can be prepared vegan). Creamed spinach cooked delicately with cheese cubes. Creamed peas cooked delicately with cheese cubes. Fresh Okra lightly sautee’d with onion & herbs (seasonally fresh only). Homemade Shredded Cheese cooked in a special blend of India’s House sauce. Homemade cheese cubes cooked with green pepper, onions and tomato with cream based sauce. Creamed spinach cooked with potatoes. Mix vegetables cooked with mild curry sauce. Potatoes and green peas cooked with onion sauce. Leavened bread stuffed with garlic and mozzarella cheese. Leavened bread made in tandoor. Leavened bread stuffed with chicken and mozzarella cheese. Unleavened layered whole wheat bread baked in tandoor. Leavened bread stuffed with onions and homemade cheese. Leavened bread stuffed with spinach and onions. Basmati rice sautee’d with vegetables. Basmati rice cooked with beef. Basmati rice cooked with peas and spices. Whipped yogurt blended with fresh cucumbers, tomatoes, onions, carrots and mint. Perfect balance for the spicy dishes. Hours: Open Tuesday-Sunday from 11:00am-2:30pm and 5:00pm-9:30pm. Closed Monday.